My wife and I were discussing our budget and lack of money today. Our discussion let to some BIG decisions on how to turn things around in a major way (Sell cars, move to smaller house…). In the midst of our conversation I got an email from Facebook. Yes, Facebook. It said that a recent post of mine is performing better than 90% of other posts on Envelope Budget’s Facebook page. I started looking through my recent transactions of envelope categories that we had gone over-budget on. Sure enough, it was lots of little things that were causing all the major problems. $60 on books at Amazon – we could have gone to the library. $30 for Movie & treats – Yeah, it was just the dollar theater, but for 5 people. $60 at Smith’s, $60 at Harmon’s, $60 at Smith’s… a number of small grocery purchases. I stumbled across an article by Dr. Charles Alonzo Peters that discussed this very topic. He talked about the psychology behind the phenomenon of overspending on the little things. First, our brains deal very poorly with the frequency of our purchases. We easily lose track of how many times we’ve spent money. Second, our brains are more concerned with the dollar amount of a single purchase only if the price of that item is above a certain threshold. If an item false below this price threshold we don’t tend to think too much about it. It is only when we are purchasing above this amount that the alarms in our head go off. Dr. Peters calls this the price threshold of concern – the price at which we seriously scrutinize our purchase. The price threshold of concern is different for everyone – even different between spouses. I remember when we first got married, my wife and I agreed that we would not spend more than $50 on any item without discussing it with each other first. I would say that that amount was our combined threshold. Really, it should have been much lower, but we were newlyweds now with two decent incomes, small rent and no kids. Now, I can’t remembered the last time we’ve discussed purchases under $300. A few years ago I had a website that started bringing in up to $6,000 extra each month (on top of my regular salary) with very little work and maintenance on my part. It was awesome! The problem was that I was not very wise with this money. We got very relaxed on our budget. Our price threshold of concerned moved up to around $100 – sometimes more. We didn’t think about or question many of our purchases. I would also venture to say that our price threshold of concern is different for different types of items as well. I would freak out when my wife would overspend on clothes or decorations, but not even think twice about spending $1000 on computer hardware. We ate out a lot, we bought whatever groceries we wanted to eat. Whatever we felt we needed and often wanted we would often make the purchase. Then came the day when Google changed some search algorithms and that “extra” money dried up overnight. It is very difficult to downgrade your lifestyle. But these little lifestyle purchases are the ones that need to be scrutinized the most. How much can we really sell our house for? Are we going to hire an agent? Take out 6% for agent commissions, plus a little more for closing costs. What kind of loan & interest rate can we get on the next house? How much is it going to cost to move (renting moving trucks, etc.)? Are all our furnishing going to fit the next house? Will we need new window coverings or furniture? So lets say by moving and downgrading you can save $300 per month on your mortgage and escrow. Over the course of a year that is only $5,000. In some situations that might be worth it, but I would guess that for most people it will cost you at least 3-5 times that amount to move. So moving to a different home may or may not be the answer, but it may take a while to recoup the costs associated with selling and moving. Next largest purchase would likely be a car payment if you have one. This one seems much more reasonable. Wouldn’t you rather give up a nice car and take a loss than to have to give up a house? But let’s continue down the budget. 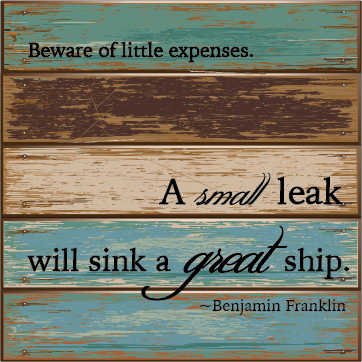 How much are you spending on the little expenses and how often. Let’s take eating out. You can easily spend $10 on a lunch by going out with co-workers. Let’s say you did that most days. That’s $200 per month or $2400 per year. Let’s take it down a notch. Let’s say you spend an average of $1.50 per business day on vending machines (soda, chips, whatever). That’s nothing, right? Well, over the course of a year that is $390. Would you pay that upfront? Maybe you would, maybe it is worth it and that’s okay. It is just a different way to look at things. Now, let’s take that $1.50 per day and put it in a long-term investment over 30 years. At the end of 30 years you will have put in $11,700, but that account would be worth over $47,700 if you made an average of 8% annual return. That is the opportunity cost those “little things” are costing you. The whole point is to start looking at those little expenditures closer. It is these little things that will drain your future savings. Watch your envelope balances closer. Some categories may be better off using the cash envelope system so that you can see how quickly you run out of funds. Train your brain and lower your price threshold of concern. Run some numbers to see how much your small frequent purchases are costing you over the course of year. Run that through an investment calculator to see your opportunity costs. You are the captain of your ship. Pay attention and keep it afloat!